On Monday night in North Ossetia, the visitors made short work of Valery Gazzaev’s revamped roster. Alan Dzagoev, who originally hails from the North Caucasus republic, knocked in Vagner Love’s rebound in the 25th minute to cool off an energetic home side. He completed his brace with another goal in the second half. 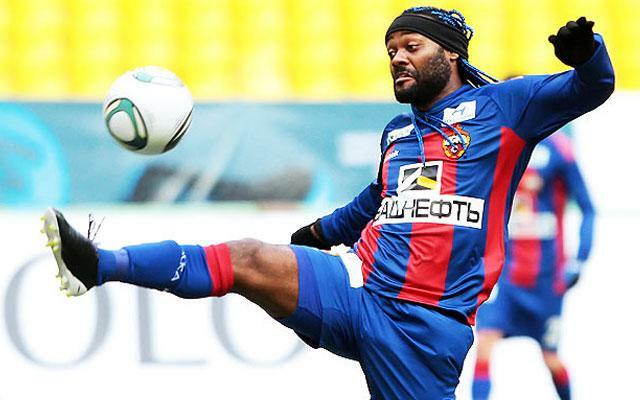 This was Love’s third match back since rejoining CSKA from Flamengo of Brazil, having previously played for the club between 2004 and 2011. Doumbia rounded out the scoring in extra time after comical defending by Bosnian defender Ogjnen Vranjes. Alania, though promising at times up front, fully deserved its 4-0 defeat. Two successive four-goal defeats (5-1 to Amkar on March 16th) leave the team bottom of the league, five points back of the relegation playoffs and 14th-placed Krylia Sovetov. Alania’s task to remain in the Premier League next season could have been much more daunting, if not for Mordovia’s 2-0 win in Samara. Of the six clubs battling to avoid relegation at the foot of the Premier League table, Mordovia have been most effective this spring. The Saransk club fired Fedor Shcherbachenko in December and brought in Daniel Munteanu to turn things around. The former Romanian national team midfielder has done his part thus far, debuting with a shocking 2-0 win over Anzhi at home, before taking three vital points on Saturday. Mordovia was simply much better than Krylia Sovetov this weekend. Apart from Shamil Lakhiyalov’s egregious miss in the 6th minute, the home team hardly threatened. Mordovia went ahead on an Anton Bober corner in the 28th, headed in coolly by Daniel Opritsa. Captain Ruslan Mukhametshin doubled the advantage just before halftime. Back at the top of the table, the momentum in the race for Russia’s second Champions League spot has shifted to Zenit. In its most impressive performance yet in 2013, Zenit drilled Terek 3-0 before a nearly sold-out Anzhi Arena. The game was played in Makhachkala, about 170 km from Grozny, after Chechen President Ramzan Kadyrov earned his stadium a one-match ban for entering the referees’ room in Akhmat Arena on March 17th to complain about the officiating during a scoreless draw with Rubin. Approximately 20,000 fans made the three-hour drive east to cheer on Terek, but Axel Witsel quieted the crowd already in the 8th minute. Left all alone in the box on a Hulk corner, the Belgian international headed home for his third Premier League goal in 12 appearances. Though Kerzhakov was denied at the spot a few minutes later by Yaroslav Godzyur, second-half goals from Brunu Alves and Konstantin Zyryanov, along with Terek defender Fedor Kudryashov’s ejection just before the break, made it a trouble-free three points in Dagestan for Luciano Spalletti’s men. The win pulled Zenit two points clear of Anzhi into 2nd place as Guus Hiddink’s club slumped to a 4-0 defeat hours earlier in Krasnodar. Winless now in six straight matches, dating back to a 1-1 draw in Hannover in the Europa League round of 32, Anzhi have collected only one point from nine in the Premier League this spring. Krasnodar, meanwhile, 10th over the winter break, moved into 8th, three points back of a Europa League place. Led by a Wanderson hat trick, Krasnodar got revenge on a 5-2 loss in Makhachkala last August, outclassing Makhachkala from start to finish. Anzhi should rebound with Samuel Eto’o, Yuri Zhirkov and Willian due for a return to the pitch in the next several weeks. It’s Krasnodar, however, who have the league’s attention. Though ownership insists that European competition is not a priority for next season, Krasnodar could move into position with three points next week in Saransk against fellow over-achievers Mordovia. Lokomotiv, alongside Anzhi, have been the major disappointment of 2013. Slaven Bilic’s club lost to Dinamo and drew with Spartak, before Saturday’s toothless 2-0 defeat in Kazan to Rubin. Lokomotiv began play this spring in 7th, tied with Rubin on 31 points. Now Rubin are all alone in 4th (and prepare for Thursday’s Europa League quarterfinal clash with Chelsea), while Lokomotiv have sunk to 10th, five points out of a Europa League berth next season. If Kurban Berdiyev can keep Rubin on track he may be in line for Manager of the Year honors. Few expected Kazan to be the last Russian team standing in the Europa League. Now, just four points back of 3rd-place Anzhi, Rubin may even be in the hunt for a medal after a lackluster fall campaign. Dinamo Moscow took care of business against Rostov on Sunday, 1-0. Kevin Kuranyi scored the winning goal in the 27th minute of a frosty Saturday afternoon encounter in the Russian capital. With the Dinamo hockey team in St. Petersburg for a crucial KHL playoff game against SKA, the fans’ attention was split between cellphone updates and the play on the field, with the biggest cheer from the crowd coming in response to Dinamo forward Alexei Tsvetkov’s goal in the 3rd period vs SKA. In a post-match interview, Dinamo manager Dan Petrescu was a bit mystified by the fans, “When they celebrated the hockey team’s goal, I was surprised… I didn’t know people were following the game directly in the stands.” Distracted fans, though, Petrescu must admit, are an improvement over the rabble that opened fire on his team with paintball guns at the tail end of Dinamo’s miserable 3-0-8 start to the season. Since then Dinamo have gone 9-1-1 and are currently second among the four Moscow clubs. Traditional Dinamo rivals Spartak welcomed Kuban Krasnodar to Luzhniki Stadium on Sunday. Their 2-2 draw in front of 17,500 allowed Rubin and Dinamo to leapfrog past the pair into 4th and 5th. A woeful Charles Kabore own goal put Spartak on top early, Aras Ozbiliz and George Bukur struck six minutes apart for Kuban after the break, before Jose Manuel Jurado saved a point for the home team in the 82nd. Expectations are rising for Kuban and Leonid Kuchuk’s squad very nearly matched crosstown rival Krasnodar’s Anzhi drubbing with a road win over Spartak. In Moscow, meanwhile, Valery Karpin’s seat will remain hot until the Red and White once again win the league or make noise in Europe. Spartak forward Artem Dzyuba’s unpleasant encounter with fans following the draw with Kuban underlines the frustration surrounding the 7th-placed club. Just as Kuban and Spartak stalled in the push for a Europa League, Volga and Amkar’s 1-1 draw in Nizhny Novgorod made little impact on their efforts to escape relegation. Both are just clear of danger, but with eight matches remaining, they’ll regret not picking up three points when they had a chance. Both goals in this game, in any case, came on penalties, Amkar’s Georgi Peev in the 60th and Volga’s Alexey Sapogov in the 69th. The big matches to watch next week are Lokomotiv – Terek, Kuban – Rubin and Mordovia – Krasnodar. Lokomotiv and Terek have a chance to reinsert themselves into the hunt for the Europa League, Kuban and Rubin could possibly create some separation from the pack near the top of the table, while Mordovia – Krasnodar features two of 2013’s most surprising and downright likeable Russian clubs. This entry was posted in Reports and tagged alan dzagoev, Anzhi Makhachkala, axel witsel, cska moscow, dinamo moscow, fc krasnodar, kuban krasnodar, kurban berdiyev, luciano spalletti, mordovia saransk, ramzan kadyrov, rubin kazan, spartak moscow, terek grozny, vagner love, valery gazzaev, zenit st petersburg by Andy Shenk. Bookmark the permalink.